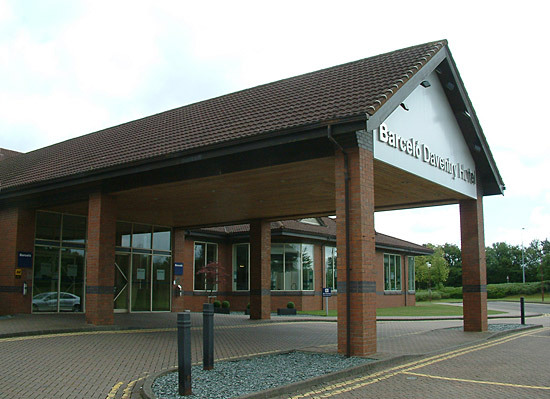 Location: Barcelo Daventry Hotel, Sedgemoor Way, Daventry, Northamptonshire NN11 0SG, United Kingdom. 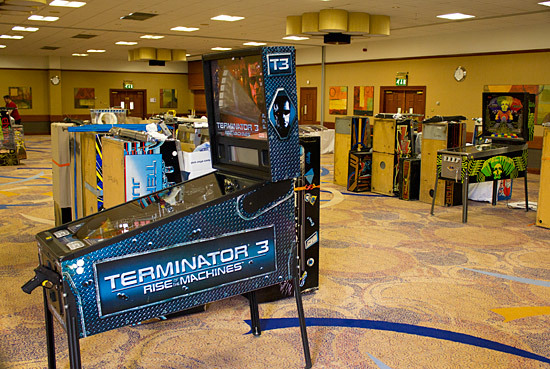 The UK's biggest pinball event took on a new face this year as the UK Pinball Show gave way to the first ever UK Pinball Party, held at the Barcelo Daventry Hotel. 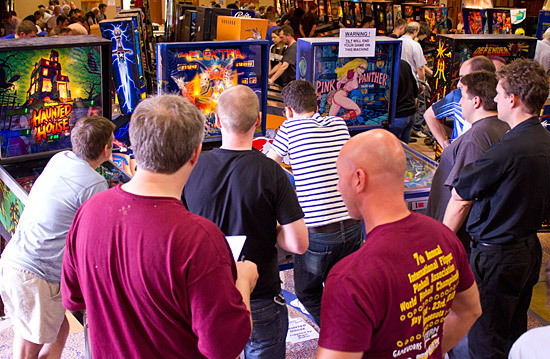 The UK has had a regular annual show in the shape of the UK Pinball Show since 2005, but following organiser Nick Bennett's decision not to hold a show this year, Andrew Heighway stepped up to the plate and formed the UK Pinball Party. 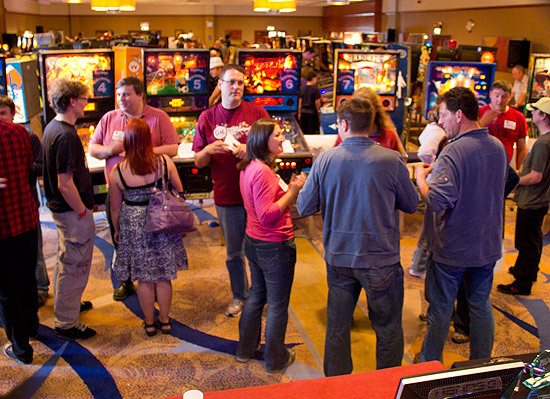 The mix was broadly the same as before - a hall full of pinballs and vendors, combined with several tournaments and an awards dinner with a special guest. There was also an added video games element which we shall look at a little later. 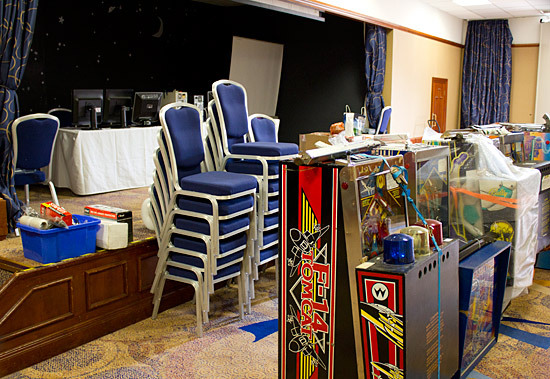 To help ensure a good supply of games for visitors to play, Andrew drove around the country in the days before the Party, picking up machines in a 7.5 tonne truck and delivering them to the venue. To help him with those collections, Peter Blakemore also hired a truck to pick up games from the South West of England to bring to the Party. Those pickups continued right up to the show opening time of 5pm on Friday, while other machines arrived with their owners throughout the day and on Saturday morning. The main public entrance to the show was at the far end of the pictures above. At the opposite end of the hall was a stage and it was here that the Pinball News-hosted tournaments and presentations took place. Once a core of machines had arrived, they could be laid out according to the floor plan and the electrical cables arranged. Andrew Harris had designed the electrical plan which was then implemented on the day by Chris Williams. With the power outlets organised, machine set-up could begin in earnest. As the clock ticked on towards opening time, the packing materials were cleared away, the power cables tidied and the computer systems readied for the public opening. Entrance to the UK Pinball Party cost £5 for Friday and £10 for Saturday or Sunday. Tickets could be purchased either on the door or in advance through the website, which also offered discounted packages including accommodation at the Barcelo and places at the special awards dinner on Saturday night. A three day show ticket was also available, saving £5 off the individual day prices. There were plenty of souvenirs available at the front desk. 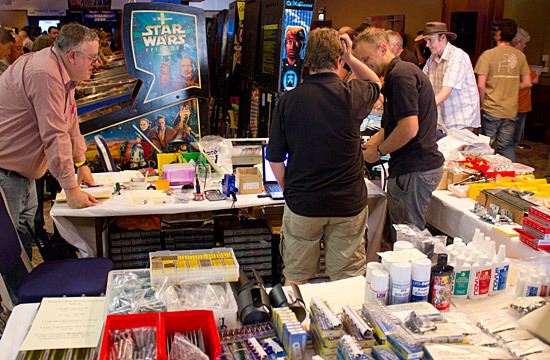 There were also several vendors selling new and used spare parts, translites, pinball memorabilia and numerous other pinball-related items. At the front of the hall opposite the front desk, Pinball Mania had a good selection of new items to help repair or maintain your game. 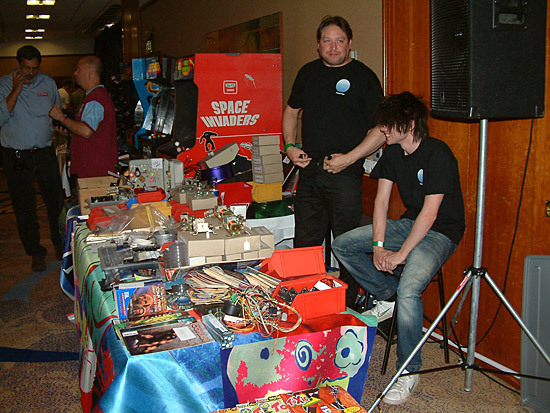 Apart from selling items from his stand, Andy Netherwood was also to be found roaming the hall looking for faulty machines to repair and bring back to life as quickly as possible for the visitors to enjoy. 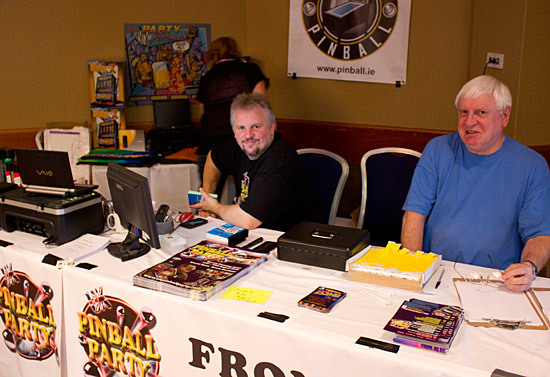 On the right-hand side of the hall, Gary Flower & Dennis Nordman were selling pinball flyers, translites, documentation and clothing. Dennis's stand included this Whoa Nellie! T-shirt, modelled here by Lorena Sibson. Dave Willcox had a wide variety of new and used pinball parts on sale at competitive prices at the adjacent stand. Meanwhile, over the other side of the hall Albert Medaillon was selling his range of LED kits (when he wasn't competing in any of the tournaments). 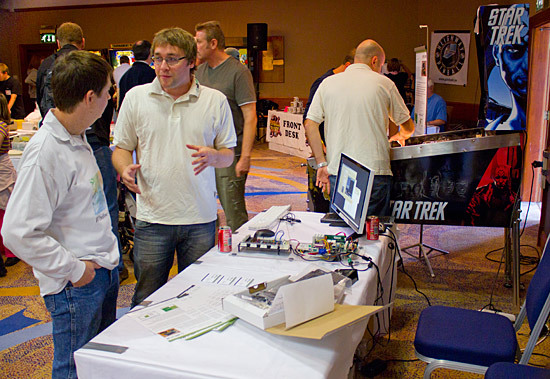 Right at the front of the hall, Millisoft were demonstrating their Pinterface pinball control system, which allows almost anyone to design their own set of rules, add sound, light and display effects, and run them all on a PC system. 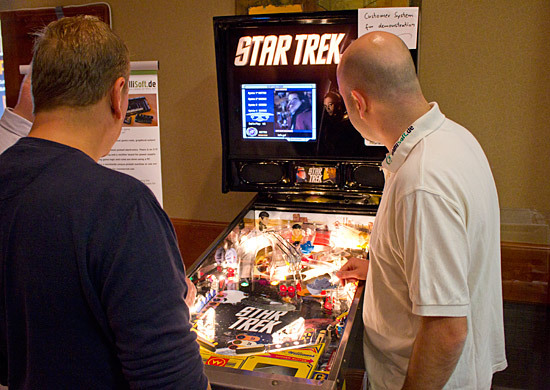 To help show how their system worked and the possibilities it offered, they brought along a custom home-built Star Trek game which ran using the Pinterface controller and features an LCD panel in the backbox for scores, instructions and video clips. It wasn't all pinball though. 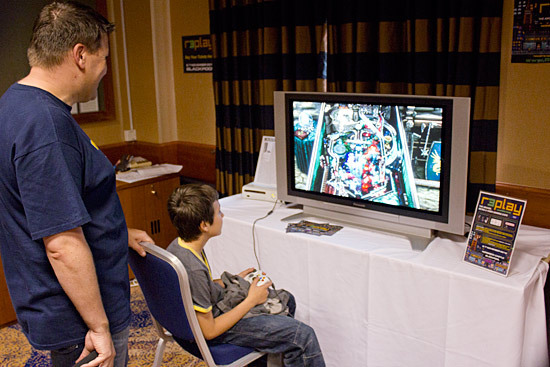 In the room next door was a display and demonstration of classic video games systems set up as a precursor to the R3PLAY show being held in Blackpool this November. Although they were all video game systems, even here there was a strong pinball presence. 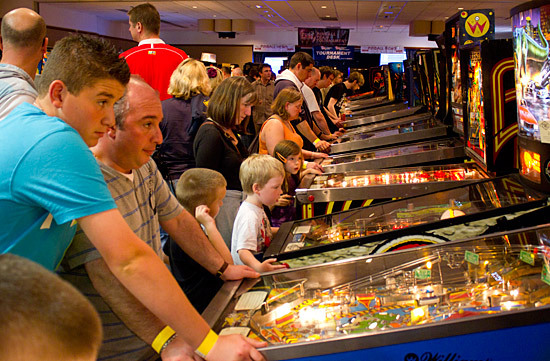 The video games proved very popular with the younger visitors and it gave newcomers a possibly more palatable introduction to pinball before they moved next door to try the real thing. 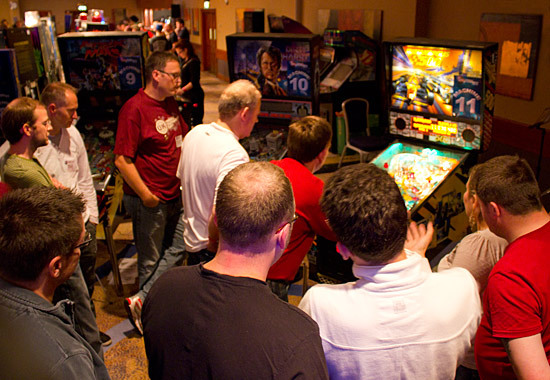 Soon after the show opened to the public at 5pm, it was time for the first competitive event of the weekend - the UK Pinball Team Tournament. 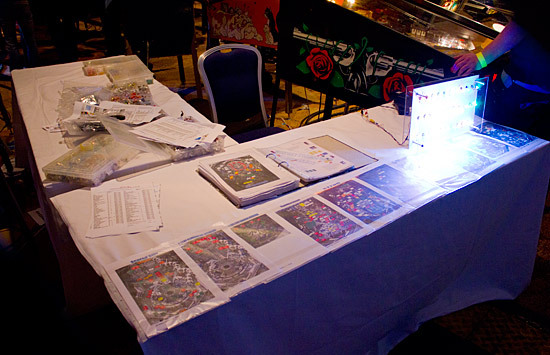 The tournament desk on the stage took registrations, handed out player badges and sold special pin badges across the three days. 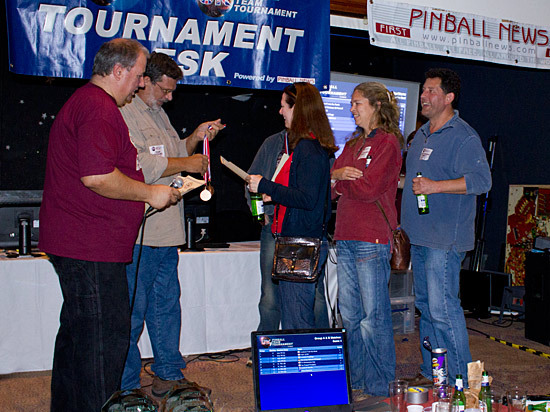 It was also the hub for the tournament scoring system by Philip Eaton and Dawn Raison, which once again used handheld computers to input the scores from the floor below over wi-fi. Overall rankings and individual machine scores were then displayed on two projectors on either side of the stage and a monitor at the front. The PA system in the hall was provided by Dawn Raison and Mike Parkins, and it was used throughout the weekend not only for tournament announcements, but to welcome visitors to the show, for the various prize giving ceremonies, the awards dinner and for the prize raffle. The machines used in the tournaments varied each day and were arranged in an arc around the stage, allowing easy viewing of all the scores as the games took place. Seating for competitors or spectators was provided along the front of the stage while the additional monitor showed detailed breakdowns of the individual tournament scores to supplement the information on the projector screens. Headed by Nick Marshall, the Team Tournament featured 16 teams of 4 players, split into groups of 4 teams, all of which played 3 of the 12 available machines against other teams in their group. Winning a match would earn a team 5 points, losing earned them nothing. This was followed by a bonus machine which all 4 teams in the group played, earning them either 9, 5, 2 or 0 points depending on their score. Entry to the Team Tournament cost £10 per team (£2.50 per player) and registration was pre-booked through the show website with a maximum of 16 teams taking part. 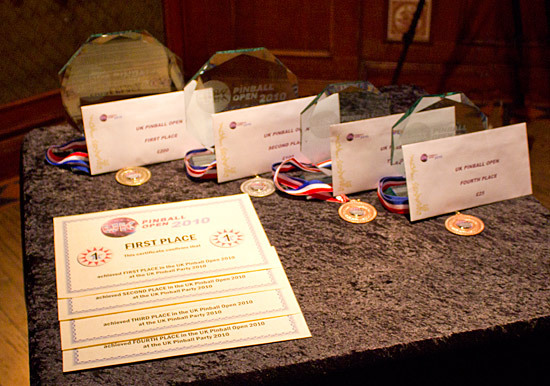 The winning team members would all receive trophies, medals and certificates while second to fourth placed teams won medals and certificates as well. All the trophies up for grabs over the weekend were on display in the tournament area. The Team Tournament qualifying round progressed quickly and to schedule, continuing until the results from all four groups were recorded. So, the Creatures From The North, The Pinball Predators, Wild Zero and The Addam's Family went through to the four team final. This was a 4-player, 4-ball game where each team member played 1 ball. The team with the highest score at the end was the winner. The final machine was drawn at random by Adeline and ended up being Indianapolis 500. By the time it came to the last ball, the Creatures From The North didn't need to play their fourth ball as they had already won. Second were Wild Zero with The Pinball Predators in third and The Addam's Family in fourth. 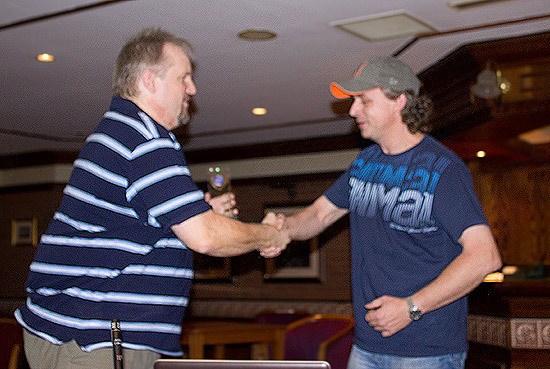 The prize-giving ceremony then took place with Dennis Nordman presenting the awards to the four teams in the final and Tournament Director Martin Ayub making the announcements. 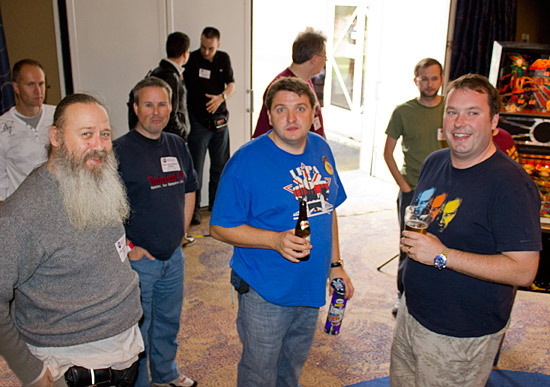 And finally, the winners of the 2010 UK Pinball Team Tournament, Creatures From The North. Ahead of the individual tournaments which would run on Saturday and Sunday, there was a 3-day-long simple high score challenge running on Mike Parkins' Cactus Canyon. When the High Score Shootout closed at 4pm on Sunday, whoever had the highest score would win a special trophy. While the Team Tournament and the High Score Shootout were taking place on Friday, more games had arrived and been set up in the rest of the hall. So when the show re-opened on Saturday morning, there was a wide range of pinballs - from Contact to Iron Man - for visitors to enjoy. The video games were: Defender, Space Invaders Part II, Cruisin' USA, Golden Tee and Real Ghostbusters. 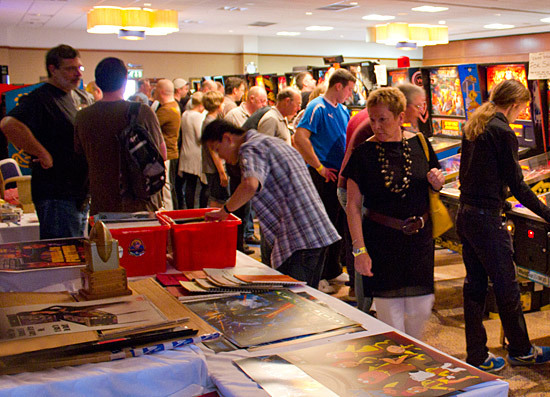 The opening of the show at 10am on Saturday also heralded the start of the qualifying round of the UK Pinball Open. The format was a familiar one with some tweaks to turn what was previously a 3-day event into a single day tournament. 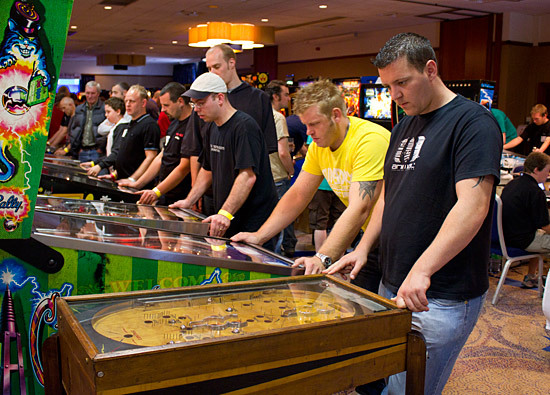 Qualifying ran from 10am until 4pm and during that time competitors could choose 6 of the 12 available machines and play a single qualifying game on each of them. The scores achieved would be ranked against all other scores on that machine and ranking points awarded, starting with 100 points for the top score, reducing as you moved down the list. An overall ranking table showed each player's points from their 6 games along with their total number of points. The 24 players with the highest points totals would move on to the next round. There were 60 pre-registered players who were guaranteed a place in the tournament plus another 12 entries which would be sold for £10 ($15) on a first-come, first-served basis when the show opened at 10am. A queue formed for these and in the end 26 players were waiting to buy entries to the Open. The 12 available places quickly sold out and the remaining 14 hopefuls were put on a waiting list in case they could be fitted in later in the day. At 1pm, with 3 hours of qualifying gone and another 3 to go, enough competitors had played their games to allow the 14 players on the waiting list to be included. If everyone had waited until later in the day to play their games it may not have been possible to include them, but the judgment was made by the team to allow them to take part, meaning everyone who wished to play was accommodated. 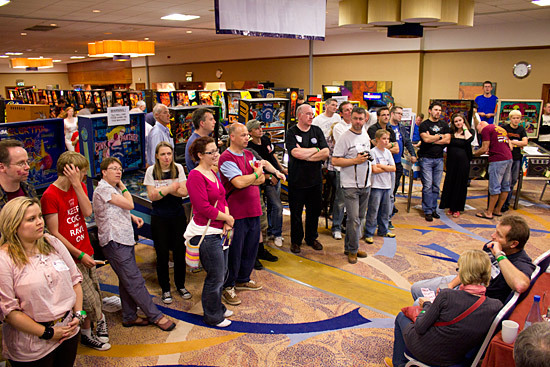 With 2 pre-registered players not able to attend, the total number of competitors in the UK Pinball Open 2010 was 86. When qualifying ended at 4pm, there was just one last game in progress, so when that ended and the score was recorded, the rankings for the qualifying round were complete. 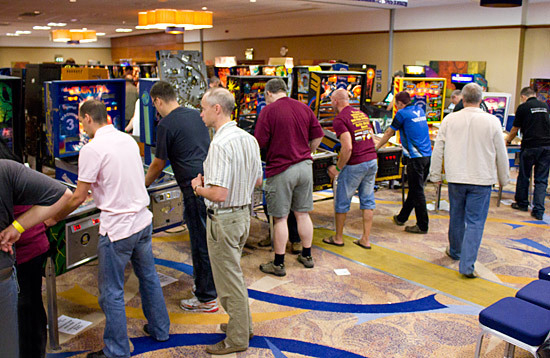 A full breakdown of all the points earned on each machine can be viewed on the UK Pinball Open webpage. The second round (quarter-finals) began straight away. 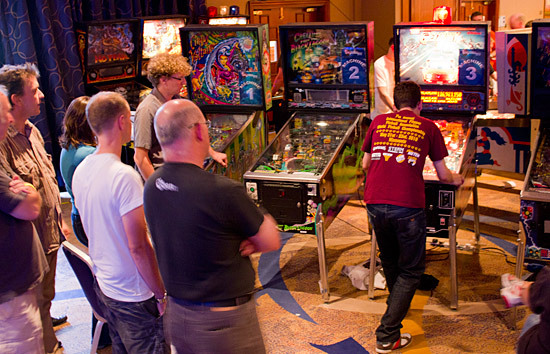 In this round, the 24 players were split into 12 pairs and played a single 2-player game on a nominated machine. 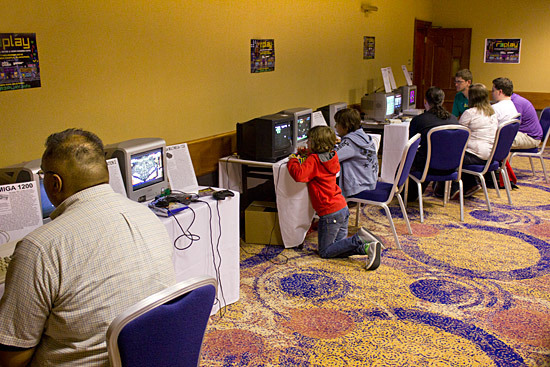 When all the games were completed, they moved on to a second machine with a different partner to play another 2-player game. This continued 2 more times until everyone had played 4 games on different machines, each with a different partner. Before each new game, players were given 30 seconds of warm-up playing time to get a feel for the machine, the tilt sensitivity, the skill shot strength and other important factors. When the first player's 30 seconds were up, the second player took over for their 30 seconds before the game began for real. The scores on each machine were ranked and the total ranking points for each player were shown on the screens. Greg Mott had devised a player/machine schedule which balanced the ranking of players so each player would be ranked against an even spread of qualifiers. When all games were finished, these were the second round rankings. The top 8 players would progress to the semi-finals. There were two semi-final rounds. In the first, the 1st, 3rd, 5th and 7th ranked players from the second round played a single 3-ball game on a randomly drawn machine. In the second, the 2nd, 4th, 6th and 8th did the same on a different machine. The first group played on Dirty Harry and the second on The Getaway. The top two players from each semi-final would go into the final. 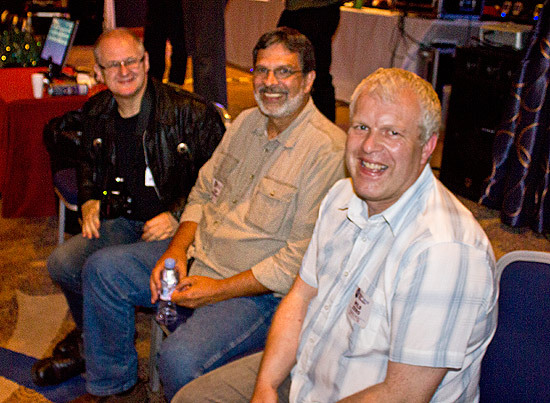 The semi-finals saw all four remaining UK players drop out to play in the 5th-8th place play-off, and Peter, Janne, Franck and Brenn go into the final. Only the final match remained, and that was to take place one hour later at the guest awards dinner, downstairs in the CATS suite. 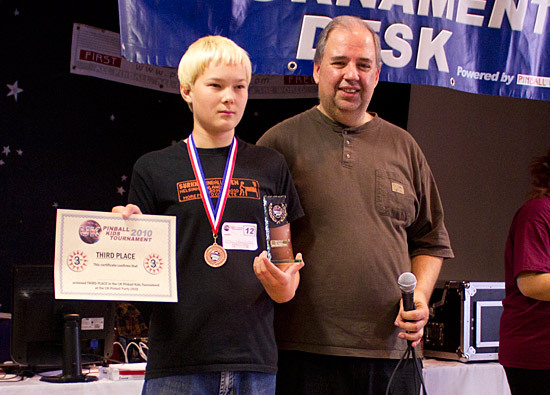 Once the Open was ready for its finale, it was time to present the trophies for Saturday's UK Pinball Kids Tournament. 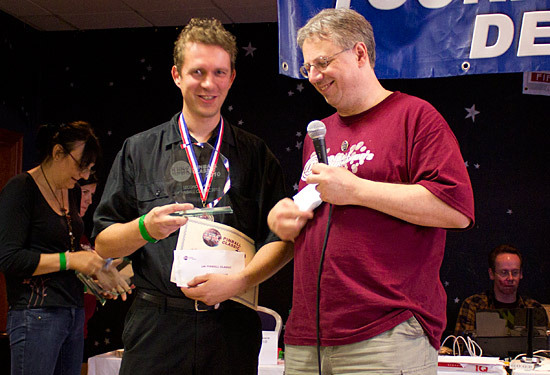 Martyn Raison's top score was almost double that of his nearest challenger and gave him first place. Roni Valkonen did likewise to secure second ahead of Benjamin Lawrence in third. The doors to the hall shut around 7:30pm and visitors either went off to freshen up ahead of the dinner, went straight to the dinner or made their own arrangements for the evening. 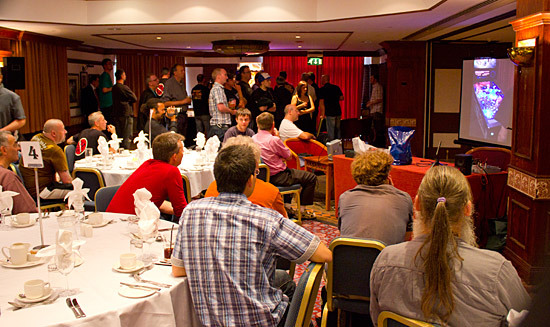 Those who went straight to the dinner got to see the final of the UK Pinball Open taking place. The final was held on a beautifully restored Williams White Water, designed by the Party's guest of honour Dennis Nordman who watched the Open reach its conclusion. He was joined by the many dinner guests who enjoyed the action in person around the machine, or by watching on a projection screen. First to play was Brenn who got off to a respectable start to take an early lead after everyone's first ball. That lead continued through the second ball and into the third where Brenn ended on a total of 320,551,430. Janne's score got up to 150,421,710 before his game came to an end and Franck nudged ahead of Janne with his 173,756,830 total. That meant only Peter could beat Brenn's score and take the champion's title. The ball lock kickout got the ball stuck - as it had earlier in the game - and the glass had to be removed to free the ball and place it in the shooter lane. Peter then needed to shoot the lock to start multiball, but a vicious rebound off the lock target send the ball into the drain, leaving Peter on 301,264,960, just short of Brenn's total. 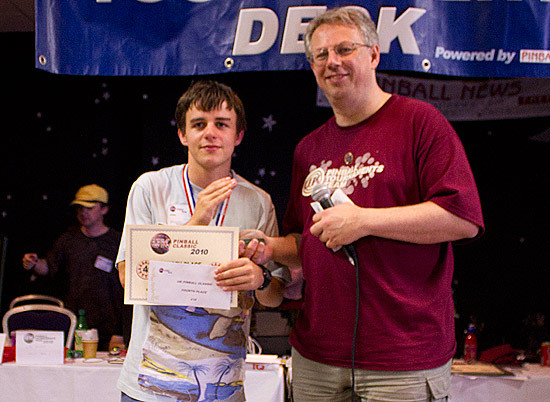 So Brenn Oosterbaan won the UK Pinball Open 2010. Dennis Nordman presented all the finalists with their prizes as the audience returned to their seats for the start of the evening's dinner. After the 3-course meal had been served, Andy Heighway welcomed everyone to the dinner and the first of the evening's awards were presented. 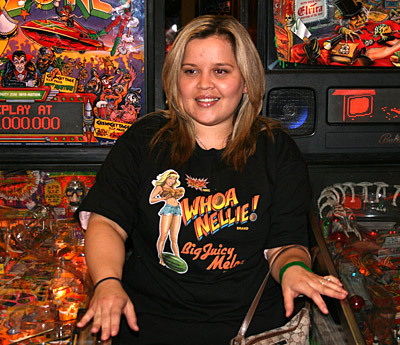 The idea for a Hall of Fame began with Nick Bennett's UK Pinball Show in 2008 when John Trudeau, Martin Ayub and Andy Netherwood were inducted, and continued the following year with Steve Ritchie, Gary Flower and Nick Bennett. 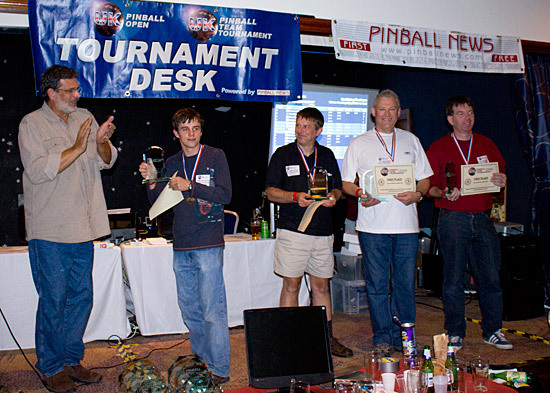 Three new Hall of Fame inductees were added at the UK Pinball Party. 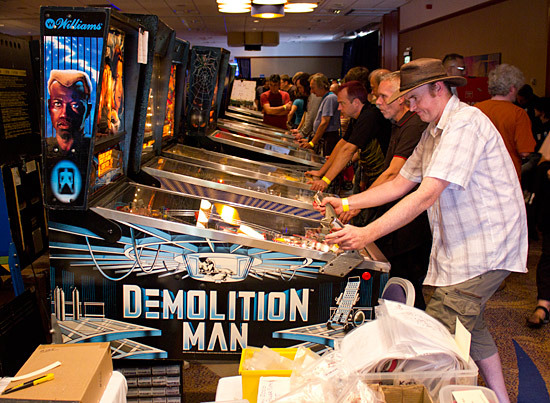 The first of these was Mark Squires who was instrumental in getting the first UK Pinball Shows off the ground, runs the Swavesey event and looked after many of the pinball repairs over the weekend. The second inductee was the evening's guest speaker, Dennis Nordman. The final new entrant to the Hall of Fame couldn't be in the hall as he was 4,000 miles away in a Chicago branch of Barnes & Noble booksellers. 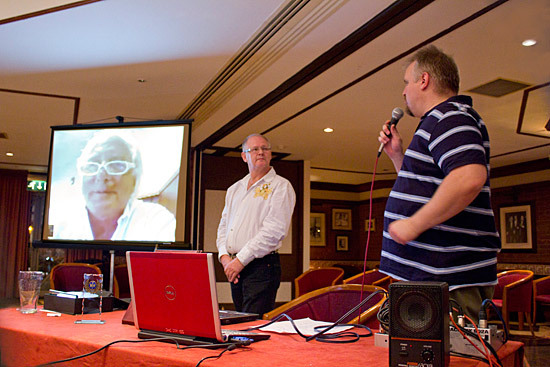 But that didn't stop Gary Stern accepting his induction and giving an acceptance speech via a video link with the UK Pinball Party. 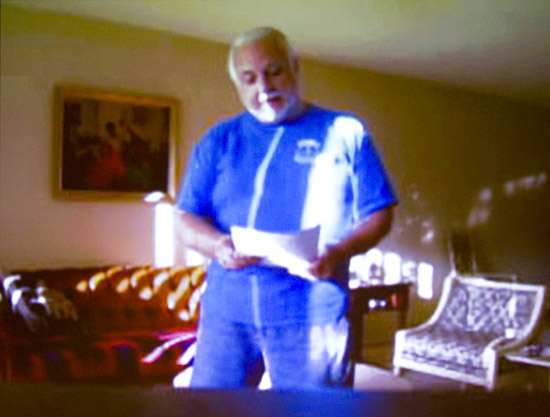 Gary Stern had his induction certificate sent to him before the show, and at the end of his speech he held up the frame to show it to the audience at the hotel. Gary wasn't the only one to make an appearance at the dinner by video. 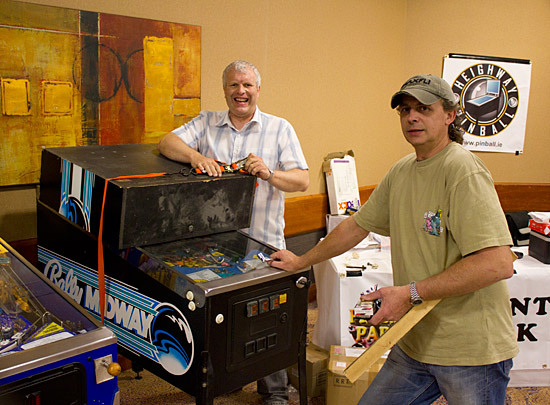 2008 inductee John Trudeau recorded a message for the audience in which he expressed his regret at not being at the show, recalled his time working with Dennis and spoke about an upcoming pinball project he is working on with pinball enthusiasts in the UK. Last year's guest speaker Steve Ritchie also sent a message to the Party which was relayed to the audience by Gary Flower. After Steve's message, two more presentations were made. 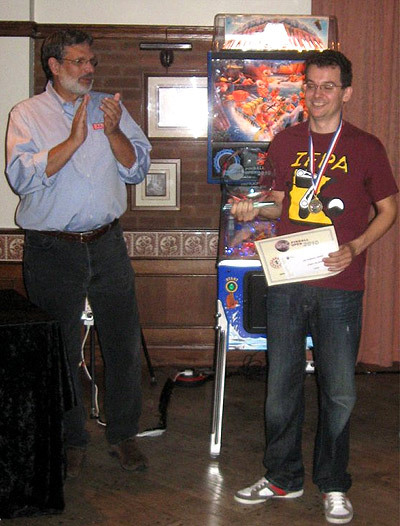 The first was the Pingame Journal award for the best pre-1990s machine at the show which went to Dave Roberts for his Elvira & The Party Monsters. 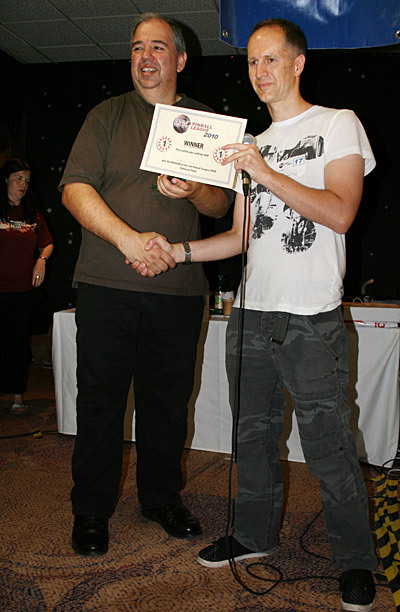 Although he sent his games, Dave wasn't able to make it to the show himself, so his award was collected by his friend Will Barber. 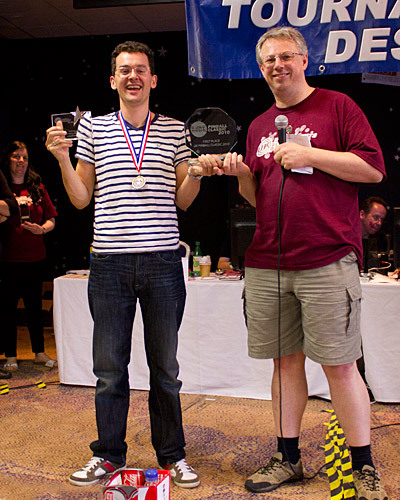 The second award was for the best dot-matrix game at the show and this was won by Darren Ball for his White Water which was used in the UK Pinball Open final. 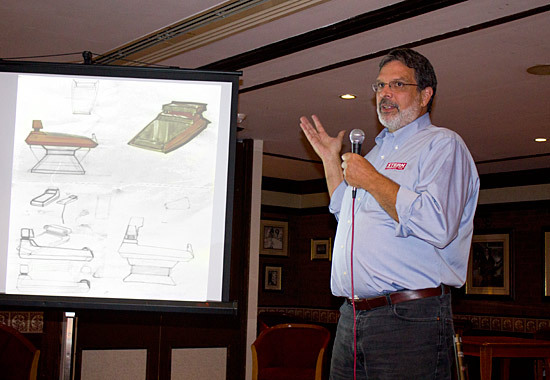 Dennis then stood up to give his presentation about his life in the pinball business, starting with his innovative designs for pinball cabinets which got him into pinball in the first place. He spoke about his days working with Greg Freres on the "Party" games - Party Animal, Party Zone, Elvira & The Party Monsters - as well as his dirt biking days and the trouble that landed him in. As the designer of two Elvira-themed games, Dennis talked about his fun experiences working with her and the trade shows they visited to launch the games. He also brought us up-to-date with his latest projects including the Whoa Nellie! game he and Greg are creating. 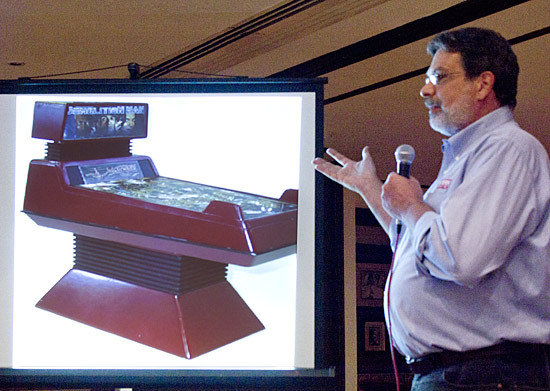 You can hear Dennis's talk at the UK Pinball Party for yourself. Just click the play button on the audio player below, click the link to the MP3 or right click it to download the file. 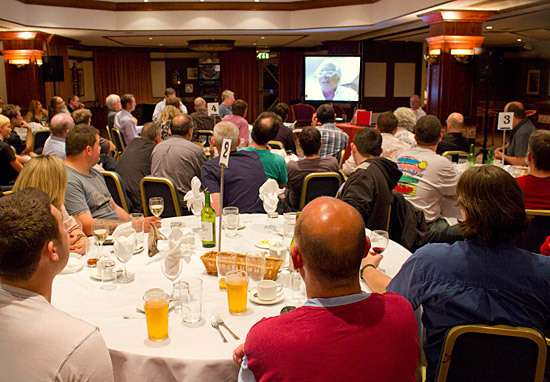 The awards dinner ended with Andy thanking the many people who contribute to the UK Pinball Party and congratulating the UK Pinball Open finalists and all those who received awards at the dinner. With that, the dinner ended and guests either stayed to chat with Dennis or retired to the Fuel bar upstairs for the remainder of the evening, while the dining room equipment was derigged. The Party's third day opened to the public at 10am, but for some the work to get the show ready had begun more than an hour earlier. 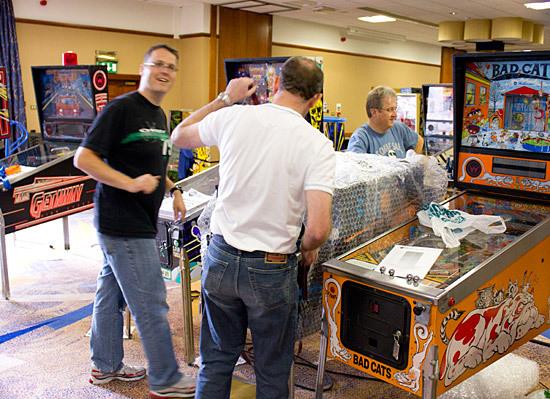 The 12 tournament machines from the UK Pinball Open had to be returned to general play and the 8 machines used in that day's UK Pinball Classic had to be installed and made tournament-ready. 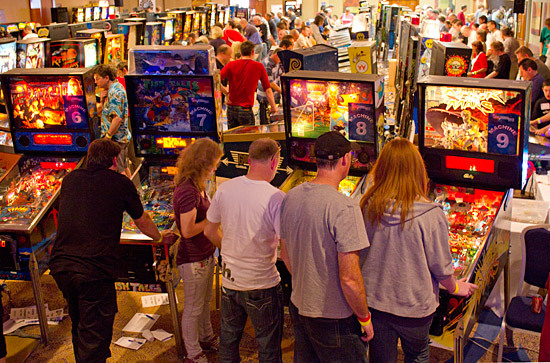 The tournament began soon after the show opened and despite some teething trouble with a couple of the machines, before long all 8 machines were in use. 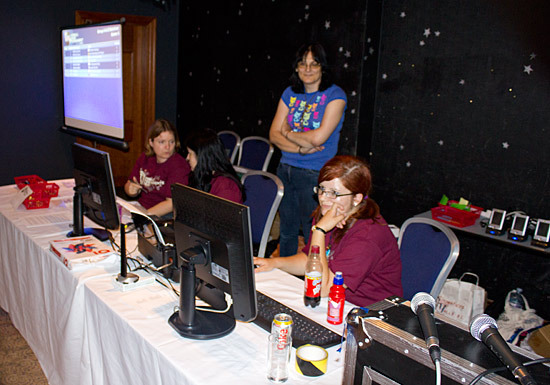 This continued most of the day with around 500 games played before the qualifying round ended at 3pm. 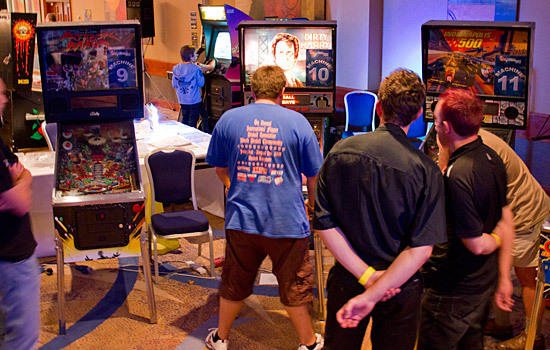 The top scoring player on each machine then progressed to the semi-finals. A player could only qualify on one machine, so if they came top on more than one, the machine where they had the greatest lead over the second-placed player was their qualifying machine and the next-placed player on the other machine would go through. This introduced a second level of strategy to the qualifying round. 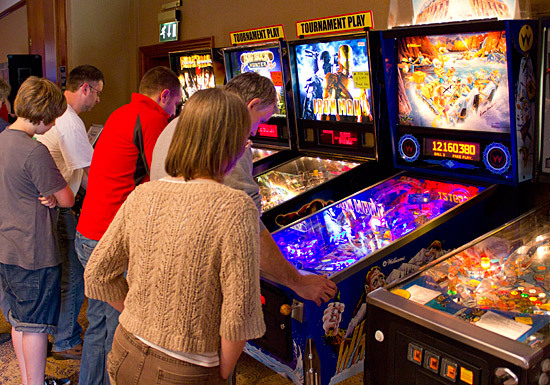 UK Pinball Kids Tournament continued with a second daily tournament and a new machine to play. Out went the Simpsons Pinball Party and in came a Bally Game Show to provide some additional variety. 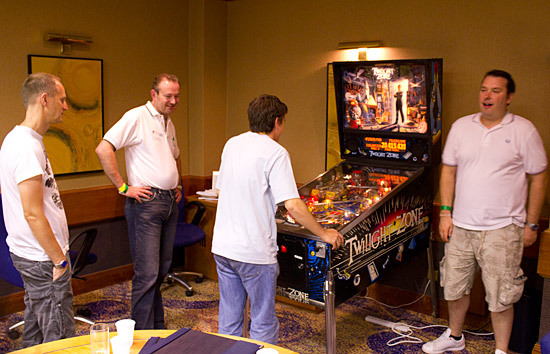 The UK Pinball High Score Shootout also continued until 3pm when the winner would be declared and there were other events being held in different parts of the hotel. 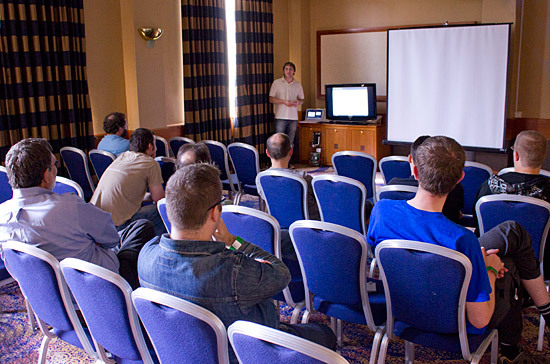 The Millisoft team moved from their stand in the hall to set up in an adjacent room and present a seminar on their Pinterface system. The narrow doors prevented the Pinterface-driven Star Trek getting into the seminar room, but it was set up just outside for guests to play and examine the workings. 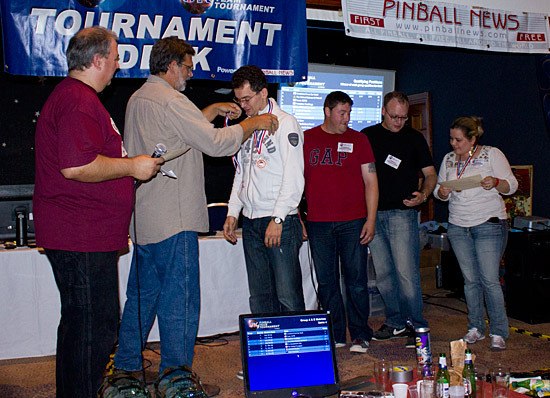 For those players who had pre-qualified through the 5 regional heats, the final of the UK Pinball League was also taking place at the UK Pinball Party. Organised by Greg Mott, five machines were moved into the Westerburg Room for the start of the 2-hour practice period which began at 11am. When the practice period ended at 1pm, the 19 competitors were split into 4 groups of 4 and 1 group of 3, and everyone played a single 4-ball game on each machine. 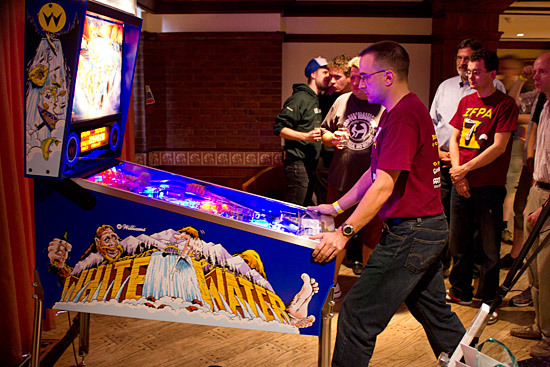 Scores were recorded and then ranked, and the player with the most points at the end would be the UK Pinball League National Champion. The 95 games took over 2 hours to complete, thanks in part to the 1 billion+ score on Twlight Zone by Nick Marshall and the 2 billion+ score on Creature by Martin Ayub. 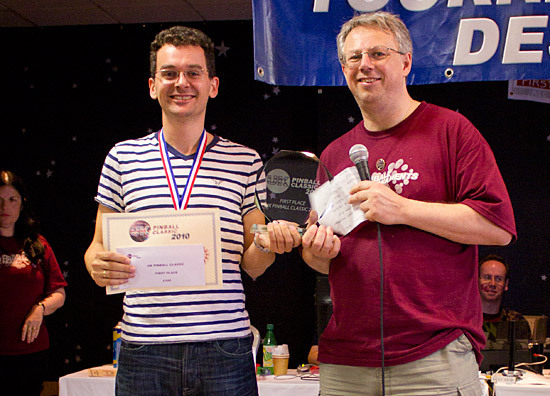 So last year's winner, Martin Ayub, retained his title of UK Pinball League Champion with Stan Simpson in second and 2007 League Champion Eddie Lehan in third place. 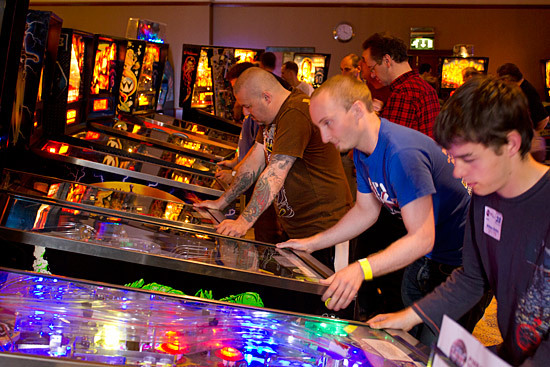 Full scores from each machine can be found on the show website in the UK Pinball League Final area. 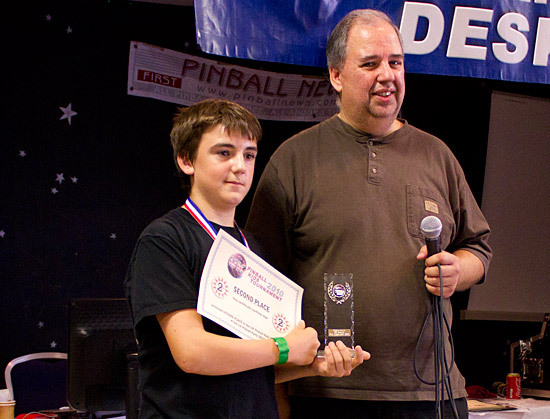 After the UK Pinball League final presentations, Greg handed out a number of trophies and certificates to the top players in each of the League's five national regions, the best young players and the best female players. 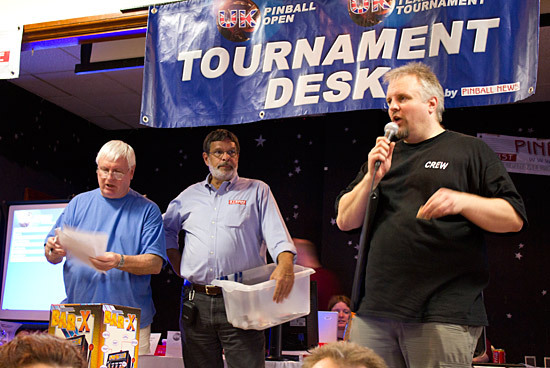 Details of the winners from each region can be found on the UK Pinball League website along with information on how to join the upcoming season. Sunday afternoon proved to be a busy time. 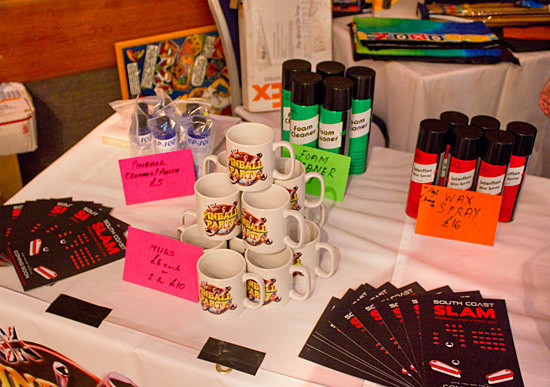 Apart from the UK Pinball Classic, UK Pinball Kids Tournament and UK Pinball League final, there was also a prize raffle. Tickets were £5 for a strip of 5 tickets or £10 for 3 strips and all proceeds from the draw went to Great Ormond Street hospital for sick children. 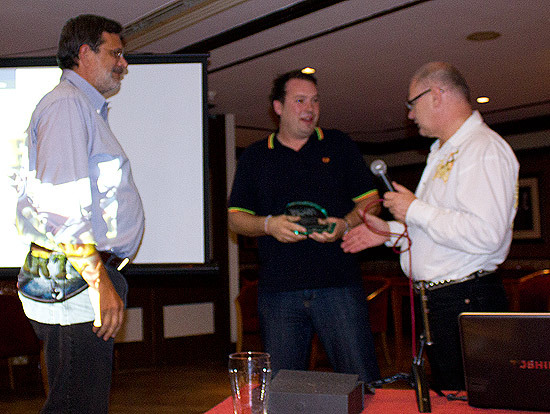 Prizes included many pinball-related souvenirs such as translites, T-shirts and plastics from Stern Pinball, T-shirts from Marco Specialties as well as beach towels and miniature slot machines from Electrocoin, a mobile phone from Mark Squires and Nokia, a laptop computer from Simon Phelps/SPC, a croquet set from Pete Matthews, a Party Animal translite signed by Dennis Nordman from Steve Padgett and a Revenge from Mars network kit from Jim Askey. 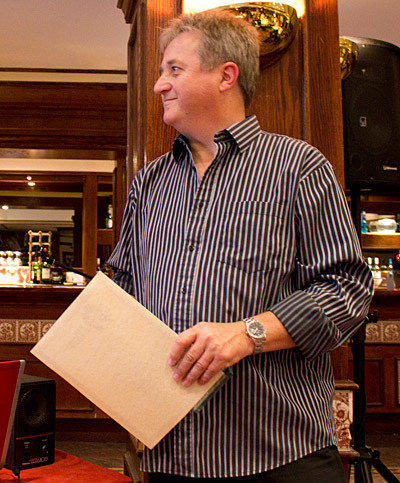 The star prize was the Party Animal machine signed by Dennis shown at the start of this report. Winning tickets were drawn on the stage in the tournament area and announced by Andy. Prizes - along with a selection of game plastics donated by Stern Pinball - were then handed over to the lucky recipients by Dennis. After all the winning tickets had been drawn, Andy and Dennis distributed the remaining pinball plastics by throwing them into the crowd. 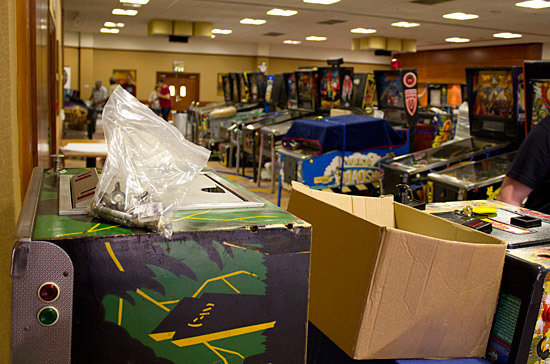 Once the raffle was over, the final stages of the UK Pinball Classic tournament could be competed. 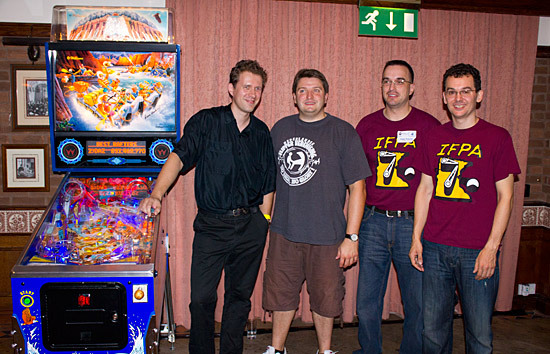 As with the UK Pinball Open, the eight semi-finalists were split into two groups and the top two from each group's game went into the single game final. The bottom two from each goup went into a play-off for 5th-8th place. In the semi-finals it was Brenn, Janne, William and Yan who were triumphant and went on to face each other in the grand final held on Elektra (which was drawn at random). Of the four, only Janne had played recorded a top 10 score on Elektra earlier in the day, so he had to be the favourite to win. Janne put up a good score of 2,200,630 but it wasn't enough to beat the previous evening's Open winner Brenn, as he scored 2,521,400 to wrap up his second win of the weekend. Janne was second, while Yann was third with a score of 1,519,440 and William was fourth on 735,220. 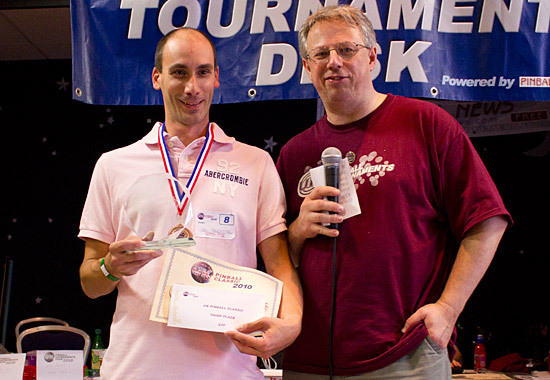 In the play-off for 5th-8th, it was Franck Bona who won the game on Haunted House with his score of 598,940 to take 5th. Timo Valkonen's 334,560 earned him 6th place, while Albert Medaillon's 316,370 and David Dutton's 132,000 gave them 7th and 8th places respectively. 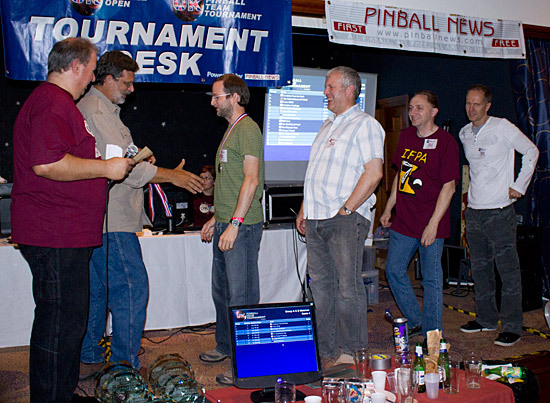 The presentations were held straight after the final and hosted by UK Pinball Classic head Mike Parkins. 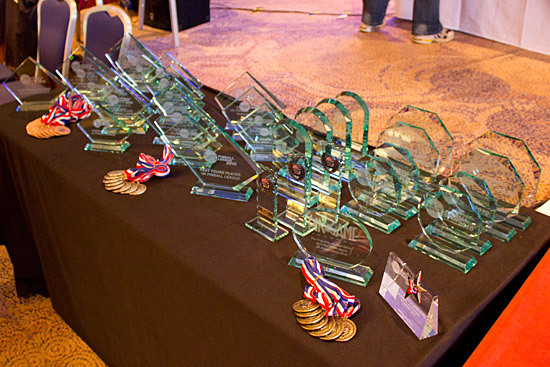 All four finalists won laser-etched crystal trophies, medals, certificates and cash prizes. 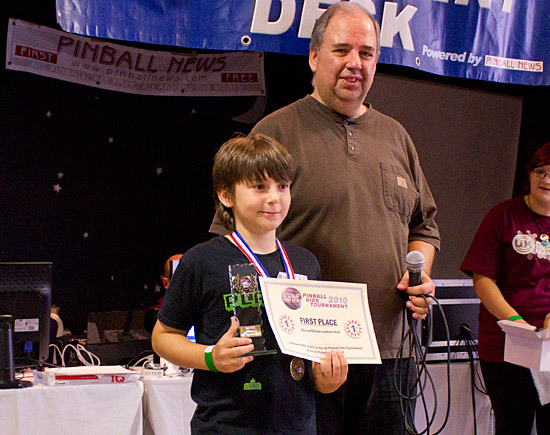 And the good news kept coming for Brenn as he also won the UK Pinball High Score Shootout on Cactus Canyon with a score of over 90 million set early into the competition. 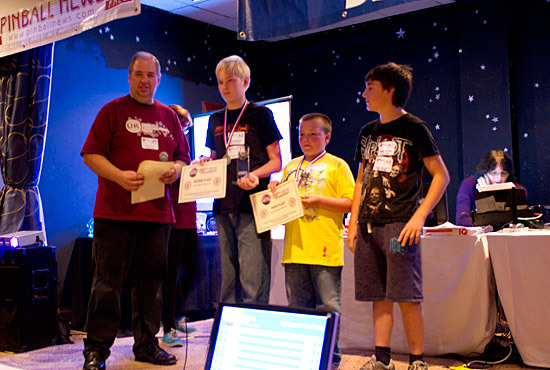 Finally, the top three in the day's Kids Tournament held on the Bally Game Show were presented with their trophies. Keeping the win in the family, Saturday's winner Martyn Raison gave way to his younger brother Tim as the two of them took the top two places. Saturday's second-placed Roni Valkonen took third place on Sunday. 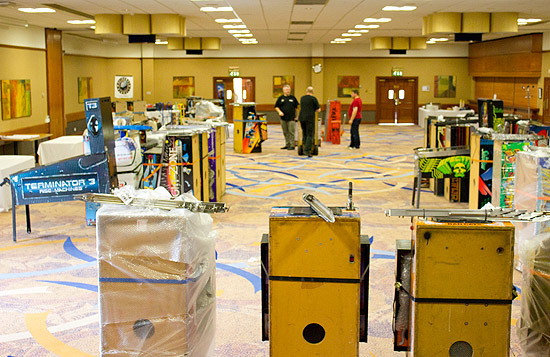 With all the tournaments completed and the prize presentations over, the first UK Pinball Party came to a close and the packing away could begin. It would take several more days for all the machines picked up before the show to be returned to their homes and quite a bit longer for all the boxes of cables, paperwork and assorted pinball parts to be sorted out. Everyone who went seemed to agree the UK Pinball Party had been a success. Holding it in a hotel in the same way as some other shows removed any travelling time and avoided any exposure to the weather (which took an unseasonal turn and rained for most of the weekend). 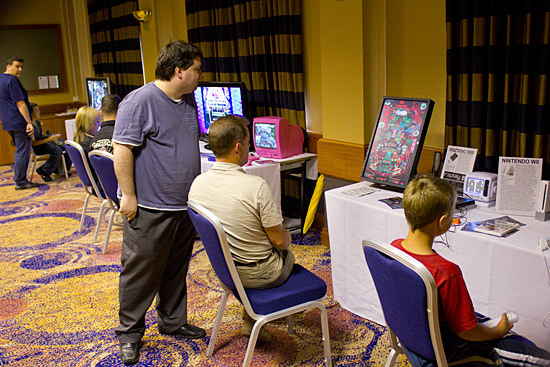 The selection of games was nicely varied, including some of the more unusual games such as Mephisto, Varkon, Fire Mountain, Elektra, Spectrum and Aladdin's Castle. Pretty much everything ran to time - even the Team Tournament which always seems to overrun at shows all around the world. 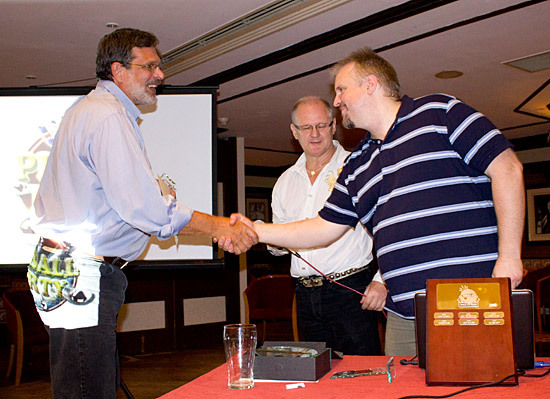 Dennis Nordman was an excellent show guest and speaker - always happy to talk about his games, sign anything thrust under his nose and present awards across the three days, in addition to his entertaining and informative dinner presentation. 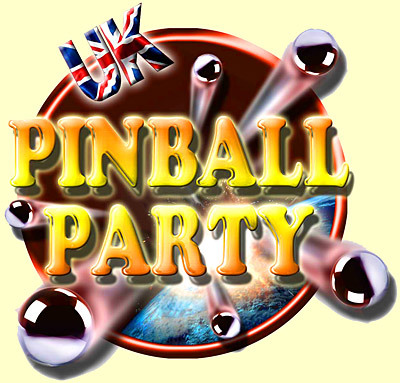 Naturally, thoughts now turn to the 2011 Pinball Party and we'll have full details in our Diary section just as soon as they are available. 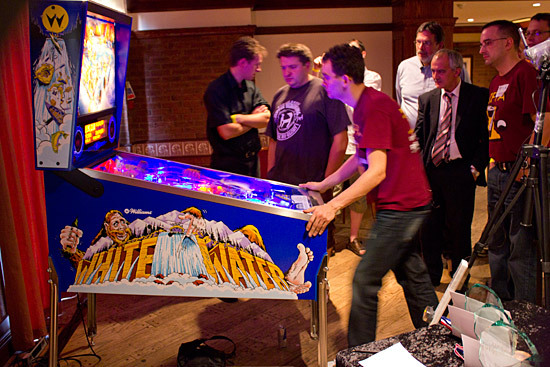 Finally then, you can tour the UK Pinball Party show for yourself with our exclusive Three Minute Tour video. Just click on the picture below to play the video.